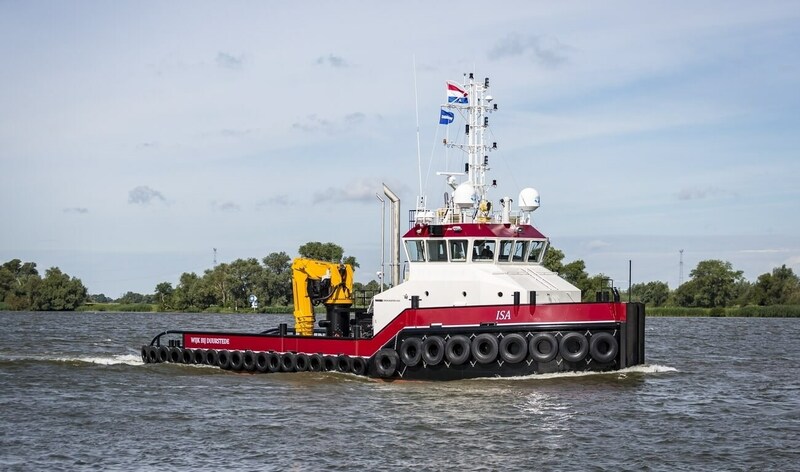 Home › Utility / Support Vessel › Shoalbuster › Shoalbuster 3209 › Shoalbuster 3209 "ISA"
ISA Towage B.V. has taken delivery of a Shoalbuster 3209 from Damen Shipyard Hardinxveld. 32 metres long and with a beam of over 9 metres, ISA is ready to operations such as towing, mooring, pushing, anchor handling and dredging support. These are supported by an equipment package specified by the client that includes twin Caterpillar engines delivering 3500 bhp for 52 tonnes of bollard pull and a top speed of 11 knots, an HS Marine deck crane giving 8 tonnes of lift at 16-metres, and a 50-tonne towing and a 12-tonne tugger winch. The fully air-conditioned interior has comfortable accommodation for up to seven crew.